I suppose that most of you have already seen software demonstration videos in youtube, metacafe and other video containing websites. They often record the computer screen activity while they perform the demonstrations. 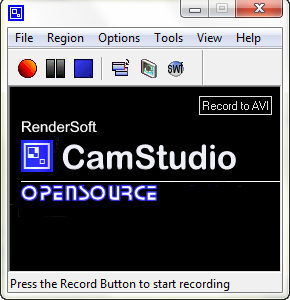 CamStudio is a pretty open source software which can Record all screen activities and audio activities on your computer and generate an AVI video. In addition to generate this AVI video, its build-in SWF producer can be used to convert these AVI file into SWF file (Flash video file). You can also add Screen annotations and Video Annotations to the desktop. Video annotations can be taken from webcam movie of yourself. Click on the Region tab to select a region that you need to record, it has three options which are Region, Fixed region and Full screen for choosing the region to record. Click on the Tools tab, you will see Screen annotations, Video Annotations and SWF producer. 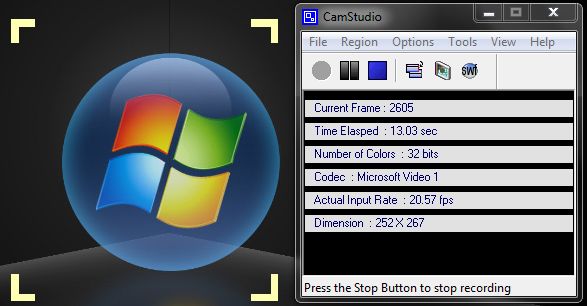 If you have a webcam in your PC, it can be get video of yourself from Video Annotations. In the Screen annotations, there are many annotations that you can add to the desktop. Although, you can Click on the SWF Producer to convert AVI file to SWF file. To record a video,Click on the Record button, select the region for capture then it will starts to record the screen. You can use microphone or Speaker sound (in your PC) to get the audio. Your method of explaining everything in this article is in fact good, all be able to without difficulty know it, Thanks a lot. then i propose him/her to pay a quick visit this blog, Keep up the pleasant work. Excellent, what a webpage it is! This webpage gives helpful information to us, keep it up. editors or if you have to manually code with HTML. I'm starting a blog soon but have no coding skills so I wanted to get advice from someone with experience. Any help would be enormously appreciated!